The dishwasher bombards dishes with soap, water and heat over several cycles to loosen, break up and break down dirt, which is then washed out an outlet drain. Interrupting this process can result not only in dirty dishes, but also in floods from stored water. Fortunately, several of the most common reasons a dishwasher does not finish its cycle have solutions that do not require a service professional. Dirty dishes after a washing can indicate the dishwasher did not finish its cycles. One reason the dishwasher is not completing its cycle is because the washer door is opening during the cycle. 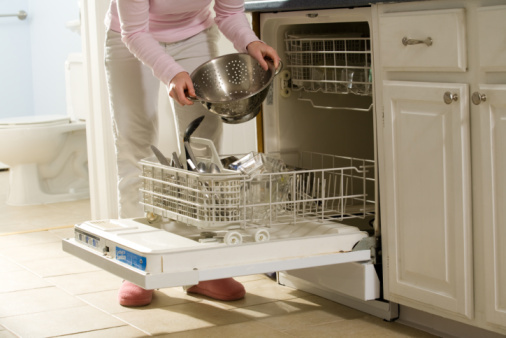 When the dishwasher door opens, the unit immediately stops all activity as a safety measure against flooding or injury. 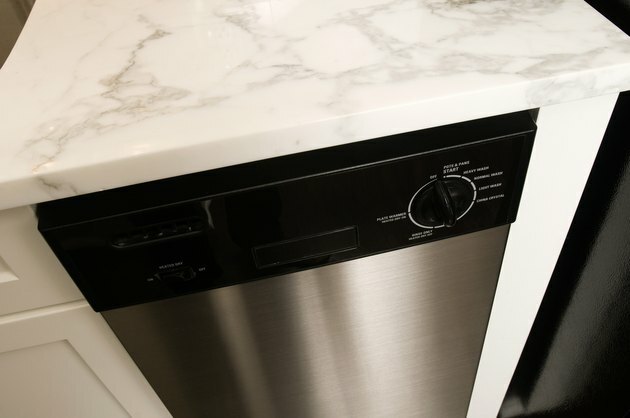 This safety feature helps when you need a glass in a hurry or you forgot to load a dish into the unit, but when it malfunctions, the lock safety mechanism can shut down the dishwasher at any point in the washing cycle. Small leaks may be visible if the unexpected shutdown is the result of a faulty door locking mechanism. A dishwasher, like a clothes washer, a refrigerator or any other appliance, has a maximum load limit. This load limit is not only a maximum number of dishes, but also a certain type of dish arrangement based on the physical dimensions of the washer. When dishes are loaded properly, they are exposed to water but, when rinsed, are heated and dried. Improper loading can lead to a lack of drying and even an inability for the washer to drain dirty water. This may result in the dishwasher stopping just before the rinse cycle. Additionally, overloaded dishwashers frequently feature instances of pots, bowls, dishes or mug handles that poke out or hang over the edge of the rack. This can prevent the door seal from closing properly and cause a door lock malfunction. Even if the door is working properly, a dishwasher will not finish if water is not available for washing. If this happens at the beginning of a cycle, check the water supply to make sure water is going to the washer. If water fills the washing tub but stops in the middle of a cycle, the problem may be a clog in the water inlet valve. Consult a service professional to repair this issue. If the problem is not so much an interruption in the cycle as dirty dishes at the end of a wash, the problem may be the heating element. Dishwashing detergent only activates at a certain temperature, and may not lather enough if the water is cold.